The working group Data Science meets Optimisation invites your to submit for one of the sessions below as part of ist stream at EURO 2019 in Dublin. Last year, we enjoyed 11 presentations, 44 contributions and interesting discussions. Again, the two directions implied by the ‘meet’ keyword will be present. You are very welcome to submit to one of these through the conference websitehttps://www.euro2019dublin.com . Please, feel free to use the appropriate submission code. 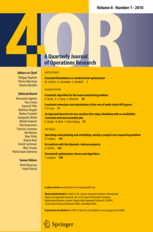 Contributers to any of DSO activities in 2019 will be invited for a special issue later this year.